Welcome to the Tropical Treat Slots Reviews . Enjoy yourself relaxing on a tropical island with beautiful weather surrounding the equator vicariously by playing the brand-new online slot machine Tropical Treat. Slotland Casino has released another game this month, and it has the amazing three-dimensional graphics and excellent gameplay that Slotland casino is known for having. 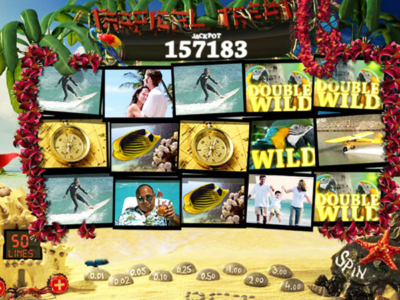 The Tropical Treat slot machine has five reels, fifty pay lines, scatter wins, wild symbols, double wilds, multipliers, bonus rounds and a progressive jackpot. Slotland casino software powers this unique video game that is compatible with mobile devices. They released this game in June 2017. Overall “Tropical Treat” slots are one of the better games to play at Slotland casino. The theme is fantastic it reminds me of being on vacation. There is a progressive jackpot tied into this game plus you could bet high limits, and there are plenty of other rewards like the double wild symbols, the multipliers, scatter wins and the bonus rounds. Imagine going on vacation to a tropical island where you can sunbathe, play water sports and participate in any beach activity that you want. The betting starts at one penny per spin and goes up to four dollars per pay line. The great news is there is 50 pay lines, which means $200 is the maximum amount you could bet per spin. Enjoy watching the compass, the globe, the amphibious aircraft, the wild, man drinking a cocktail on the beach, the double wild, the free spins symbol, the family on the beach and all family members playing in the ocean. Hit five of the “Compass” or the “Globe” icons in a row while betting five dollars minimum and collect the progressive jackpot. Slotland casinos progressive jackpot is worth $308,144.22 as of June 7, 2017. Will you be the next lucky winner? The free spin’s image is the scatter symbol. Win ten bonus games when you score three free spins images on the wheels. You cannot win the progressive jackpot during the free spins bonus round, but you can hit big multipliers that will increase your bankroll. Land five of the Globe or the Compass icons betting less than five dollars and trigger the 1,000 X multiplier.There is the regular wild and the double wild. The first wild will replace the other icons to put together a better combination. The wilds will not replace the scatter. The double wild substitutes for all combinations including the scatter plus doubles your wins.